I need the transaction id so I can transfer my domain away from yola. All I got was the auth code. When you want to transfer your domain away from Yola, we send you the auth code and you give this to your new registrar. I am not sure what you are referring to when you say "transaction id", possibly this is the terminology your new registrar uses for "auth code". Hope that helps! Godaddy is requesting a transaction ID which they send to the domain registrar and an authorization code that I need from you guys. I'm sorry, just trying to understand what it is you are trying to do. Is your domain registered with GoDaddy and you are transferring away from them? Or are you transferring from Yola to GoDaddy? If your domain is registered with GoDaddy they will need to provide you with any information for the transfer. I do apologize if I am not understanding your question, but we do not have a transaction id to provide you with, just an auth code. I am transferring from you guys to godaddy. They send the transaction id to the email address that is on file with the whois registry. I then need the auth code you guys provide to transfer it. 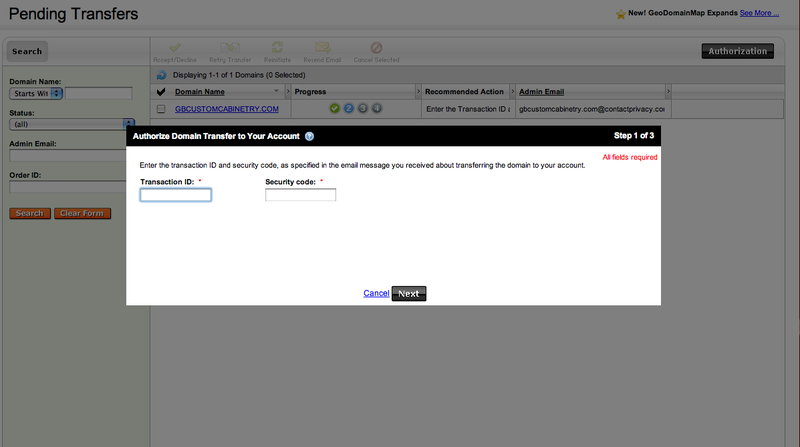 I need to put both the transaction id and the auth code in on godaddy's side before they will transfer it. I took a look at GoDaddy's help pages and it looks like this transaction id is something you should have received from them, here is a link to the page I found this on: Accepting a domain into your account. Right, they send the transaction id code to the admin email on file with the whois registry. This was not sent to me from your email. http://help.godaddy.com/article/1592#... this is what I need after clicking on the authorizing domain transfers to your account drop box. I need these two codes to transfer to godaddy. At least change the admin email to my email. Can you send an email to support@yola.com and I can then speak with someone about this and find out what we can do to take care of this for you. I'm sorry for not having the exact answer from you, but I have not had a request like this before. Thanks! Thanks! I have received your email to support and have replied. I will continue to assist you from there.